Hello and Happy News Years Eve! It's brutally cold here in CNY so I for one am staying in and close to the fire. Hubby has to work..he should make it home before the "ball" drops in Time Square, so if I can keep my eyes open, we can ring in the New Year together anyway. 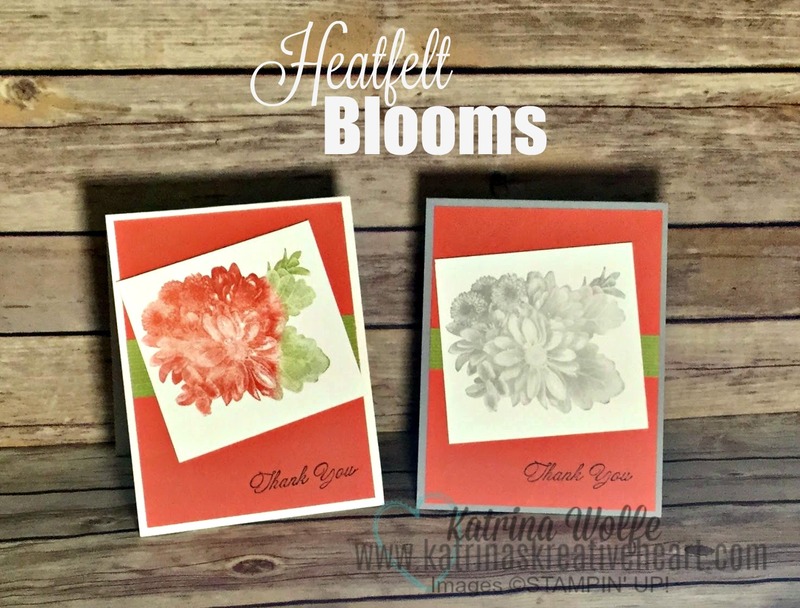 In the meantime, I have a couple of cards using the new Sale-a-bration stamp set, Heartfelt Blooms with you. I can't decide which I like better? Which do you prefer? Card #1 in the photo is done with sponge daubers and Calypso Coral and Old Olive ink pads. Card #2 is Smoky Slate ink. Cards #1 uses a standard card base of Whisper White 11" x 4.25" scored and folded at 5.5" creating a top folding card, Card #2 uses Smoky Slate cut and scored the same. Both have a layer of Calypso Coral cut 4" x 5.25" and a piece of Petal Garden DSP cut for card #1 1" x 4" and Card #2 .75" x 4". For the stamped images on both cards, the Whisper White is cut 3.25" x 3.5"
I hope you enjoyed today's cards. Let me know which you prefer. Card #1 or Card #2? I would love to hear.